Would someone let me know when Tommy Wiseau has faded back into relative obscurity? The bizarre cult filmmaker behind The Room, now given greater life thanks to James Franco's The Disaster Artist, has been riding the popular wave for months, and with the film set to hit Blu-ray soon he has been everywhere. His latest stunt/gimmick to gain attention has been asking to play the Joker in a Batman movie. Hey, he has to be better than Jared Leto, right? Well...no. As it turns out he's not better, and we have definitive proof. 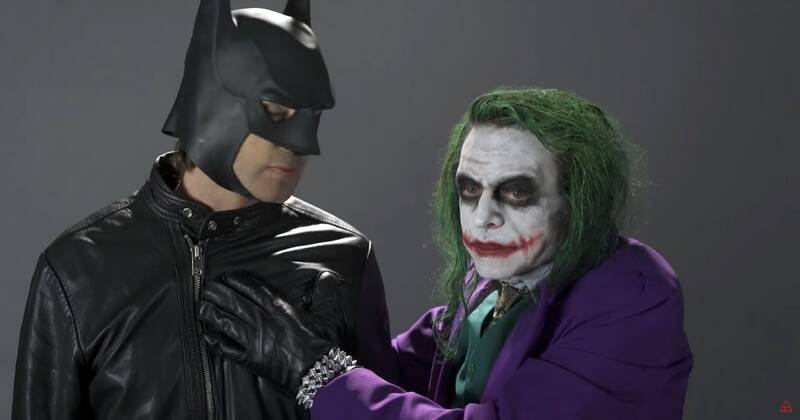 Nerdist hung out with Wiseau and let him have his moment to shine, capturing him in a 3-minute audition tape as the Clown Prince of Crime. The performance is straight garbage and makes you appreciative of EVERYONE who has ever played Joker. It's loud, shrill, and at least to me it comes across as manufactured crazy, not legit bonkers. Basically this is just Wiseau doing cosplay. Make that Wiseau and Greg Sestero doing cosplay. His Batman is kinda funny for being so lame, not gonna lie. Check it out, and pray Warner Bros. doesn't get so desperate as to actually cast Wiseau in anything. Knowing them they just might.